Earlier this year, the CareKit-supported One Drop Blood Glucose Monitor launched on Apple.com, allowing users to get pain-free results in just seconds, with data easily displayed on the compatible iOS app. After a few months on the market, One Drop has today released new findings and is reporting that its kit has catalyzed "a substantial improvement in glycemic control." In total, the study accounts for 3,500,000 app log-ins and over 200,000,000 primary health data points entered by its users over a period lasting between 2 months to 1 year. The data comes from One Drop mobile app users on both iOS and Android who have either type 1 or type 2 diabetes, and who have consistently followed the company's app guidelines by entering two glycated hemoglobin (A1C) values at least sixty days (but not more than one year) apart. In June 2016, prior to One Drop's wide release, initial analysis showed a 0.7 percentage point reduction in A1C for One Drop app users, going down from 7.8 percent to 7.1 percent. Now, One Drop has repeated its analysis "on a much larger sample" of users, and discovered a 1.0 percent point reduction in A1C among app users, decreasing from 8.2 percent to 7.2 percent. Diabetics are encouraged to take A1C tests at least twice a year, in order to measure their average blood glucose level during the previous 3 month period. The American Diabetes Association encourages those with diabetes to aim for an A1C test result of less than 7 percent; people without diabetes typically range between 4 and 6 percent, so the lower the result the better. As One Drop pointed out, the more that its users visited the app and tracked their blood glucose and food intake, the more their A1C improved. At the same time, inflated results from the glut of new users post-launch also factor into the .30 percent increase between the findings last June and this month. The company mentioned that, although the findings might appear small, "this is just the tip of the iceberg" in terms of testing and improvements coming to One Drop. "The improvement in A1c we've seen among our users is often achieved with drugs, but rarely, if ever, seen with self-care interventions," said Jeff Dachis, Founder and CEO of One Drop. "With One Drop, we are delivering a well-designed, evidence-based diabetes solution that provides cost-effective, comprehensive care to anyone, anywhere in the United States and, soon, anywhere in the world. The company's app also has an on-demand coaching service called "One Drop Experts" -- available in the Premium plan -- which gives users 24/7 in-app diabetes support from Certified Diabetes Educators, and even a digital therapeutics program to keep every aspect of their program on track. One Drop has additionally tracked activity from this specific section of the app as well, and discovered the following took place over a four week period. For those interested, the One Drop Blood Glucose Monitoring Kit sells for $99.95 on Apple.com, while the One Drop for Diabetes Management app is free to download on the iOS App Store, and includes Apple Watch support [Direct Link]. One Drop's advantages include a lancing device that has custom depth settings to ensure that each user can discover the right amount of pressure and get "a perfect drop every time." The Premium subscription plan ensures users never run out of test strips, in addition to access to One Drop Experts. In 2016 One Drop was one of four apps that launched with Apple's CareKit platform, which allows app developers to design and launch integrated software to facilitate better communication and information gathering among doctors and their patients. The other three apps were fertility tracker Glow Nurture [Direct Link], maternity app Glow Baby [Direct Link], and depression medication tracker Start [Direct Link]. 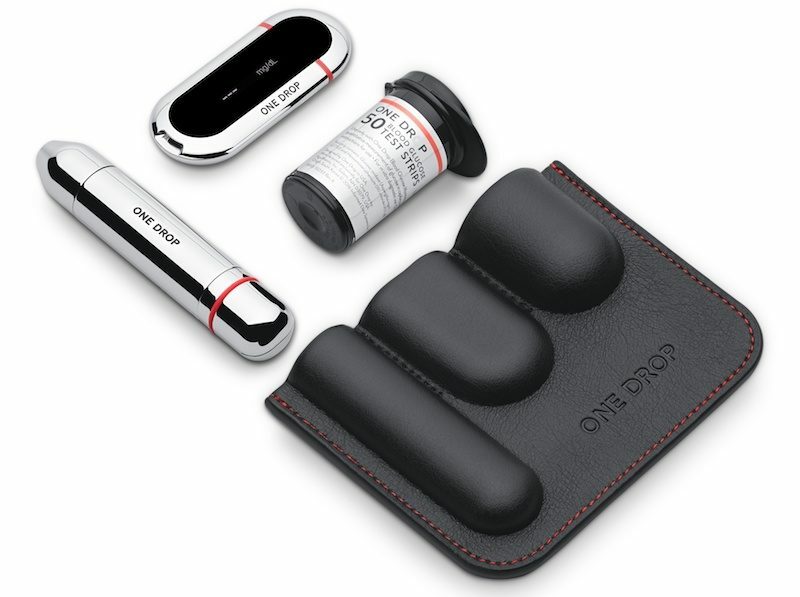 For One Drop, Founder and CEO Jeff Dachis said that the company intends to continue its expansion and encourage the spread of diabetic knowledge in the process: "As we expand, we will maintain our focus, empowering everyone with diabetes today to make better choices and lead fuller lives." I used iHealth's meter and app for some time until I started seeing regular inaccuracy in my results. I switched to a Bayer Contour Next meter and strips and continued to use iHealth's app to manually enter and track my results. So you can use many free apps for tracking irrespective of the meter and strips you use. What I learned is that type 2 diabetes is due to insulin resistance. The way to become insulin sensitive aka a non diabetic (for type 2 only) is to reduce insulin as much as possible for long periods of time. This means eating a ketogenic diet and it means fasting / intermittent fasting. Treating a type 2 diabetic with insulin is like treating an alcoholic with alcohol. Sugar / Glucose / carbohydrates are not an essential nutrient. Essential nutrients are nutrients that we have to consume because our body cannot manufacture them. The liver can convert protein and fats into glucose that certain parts of our body need. Er, a blog? Does he have published, peer reviewed papers and data? Surprised I haven't heard about this yet. The bottom line is that Dr. Fung's assertions and proof positive work doesn't fit the narrative we are fed practically from every source regarding obesity and T2D. Dr. Fung is a Nephrologist in the field trying to make a difference and is challenging all the conventional wisdom, or purposefully lack thereof. Maybe. He's also built up quite a business and marketing machine. When one expert in a field stands alone and claims that the generally-accepted view is wrong, it is appropriate to view him with a critical eye. Not buying this. Show me an article in the New England journal of medicine and I will think about it. What's so hard to believe? As a diabetic, I'm reading this and I think, "duh, this is so obvious, but you don't need this product to achieve these results." Is anyone surprised that people who self select as subjects who are motivated to track their daily blood glucose fluctuations with a coach helping them to understand their results would end up seeing modest, but significant improvements in their A1C? I think the more useful critque of their reported findings is how many of these "improvers" see continued improvements or maintain their discipline 2 to 5 years out from the time they were initially being observed. I think this is a great idea and the more people who have a hand to guide them through management of a chronic condition, the better and I'm really surprised at how inexpensive the service is. It costs $40US/month or $33.33US if paid annually. You get counseling AND unlimited test strips. I'd have to see it to believe it if the test strips really are unlimited, but even if I'm just receiving 150 strips a month, the subscription fee would more than pay for itself. I'm tempted to try this service just for the promise of unlimited test strips, but that has the too good to be true ring to it and I don't know the reputation of this meter. Instead they write a script for Metformin and smugly assume they have another recruit for the growing army. I actually am a successful practitioner of the lifestyle, food, and testing regimen as a way of maintaining normal blood sugars as a diabetic, but I find your cynicism more than a little offputting as someone who's been a healthcare clinician before. Perhaps you've had really bad luck with the doctors you've encountered, but I've found that the issue is that most doctors do not have enough personal experience or training to be credible counselors to diabetics and the training they have received may be dated. Even if they have kept up with developments, what physician has the time to provide one on one counseling on blood glucose control and even if they did, how many of those people will actually be motivated enough to follow through? Their job is to help you to the best of their ability without doing you harm and as much as I hate to admit it, the "here take this pill" regimen might actually produce the better overall results for a population even while it produces poorer results for each individual. If you have 10 minutes of time to change an almost stranger's life, telling them to take this pill and hoping that they'll have the motivation to go beyond that is a reasonable bet. There are any number of reasons why a physician could resort to drug based therapy that has nothing to do with greed or malice. This is just a way to track blood glucose, and it could easily be done with pencil and paper for less. However, if having the app encourages use, that may well be worth the extra money. Knowing and understanding how one's body reacts to food is a powerful tool in diabetes. I'm not at all surprised by the results for consistent users of the app. I was a 6 foot tall 170 lb 22 year old when I was diagnosed. How much weight should I have lost? My niece was a 105 lb 26 year old with a gym membership that she used. How much weight loss or exercise increase should she have done? It's easy to get caught up in blame, and everybody is different. I like to say that if I were in someone else's shoes, I'd do exactly what they did because I would have had the same experiences. That said, the majority of Type 2 diabetes is the body's reaction to a constant excess carbohydrate in the modern diet. A hundred and fifty years ago, doctors were just discovering the disease. At that time, it was estimated about 1 in every few thousand people had it, and it could only be studied in large cities because it was so rare. Today, about 1 in 8 Americans have diabetes. It's hard to imagine that diabetes isn't affected by what a person eats and does. Of course, it's possible that you're one of those rare one in 3,000 people who just would have gotten diabetes no matter what. There are definitely people out there like that, and your apparently normal weight makes me wonder. However, don't assume that just because you were not overweight that your body wasn't having trouble processing carbohydrates. The majority of people with Type 2 diabetes can be helped or have complete remission of symptoms. (I linked to studies in an earlier post.) Even if that's not you, it is probably worth more investigation. At the very least, eating less carbohydrate-heavy food would likely help with hunger. You are not a medical doctor, and you should not be giving medical advice on the internet to those of us who have a genuine medical problem. If you fail to understand why this is a problem, then you are too foolish to listen to any further. I am not giving medical advise. I am sharing my experience and referring you to a Doctor's site for medical information. If you have blood sugar levels that are high and not under control, that needs to be dealt with first and of course under the care of a medical doctor. Tracking blood glucose is fine, and people with diabetic family histories or symptoms should use the wonderful tech that's available today. On the not so good side of the ledger are the doctors and pharma shills who claim that diabetes is a one-way street, once it's been diagnosed there is no way back. Then they begin the regime of drugs and protocols to "manage" the disease as it becomes inevitably worse. The truth is doctors could spare most pre-diabetics of this nonsense by instead prescribing lifestyle changes -- lose weight, switch to a diet with drastically fewer carbs, and get some exercise. Instead they write a script for Metformin and smugly assume they have another recruit for the growing army. Just came across your post and have to say you hit the nail on the head and straight into the board. I'm Type 2 and do to my own negligence my sugars/weight increased over the winter. Now I want to use technology, i.e. the watch and apps to track my progress and get my life back with out the metformin. He does have IMHO some very good videos ('//www.youtube.com/watch?v=mAwgdX5VxGc') on youtube. I'm a veteran and having a new doc talk to me about diabetes and diet when there grossly obese is humorous / sad. I research things to death. There's this ('https://arstechnica.com/science/2017/02/a-fasting-diet-may-trigger-regeneration-of-a-diabetic-pancreas/'). And a little more here ('https://www.ncbi.nlm.nih.gov/pubmedhealth/behindtheheadlines/news/2017-02-24-fasting-diet-may-help-regenerate-a-diabetic-pancreas/'). And from the BBC ('http://www.bbc.co.uk/news/health-39070183').